Royal Vegas Casino is one of the older group of online casinos. They’ve been around since 2000 so they’ve seen all of the changes that have occurred in the casino online business. They’ve weathered some of the storms and have emerged stronger than ever. Any casino that offers 600 games with about forty banking options will have areas that need improvement. 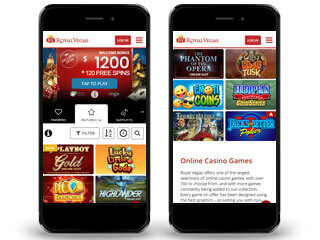 We’ll point them out as we go along but the overall impression from long-time players at Royal Vegas is that the casino continues to run with the crowd, adding innovations as they become accepted and popular, but perhaps not leading the crowd, and remains a top online casino. One area where Royal Vegas has followed the crowd successfully is in becoming an instant play casino. Instant play is becoming very popular as it saves your hard drive from the heaviness of a full download and allows gamers to play at a number of casinos and sample games from a number of game providers. At one time, if you wanted to play slots online, you had to download an entire casino; with instant play, that is no longer necessary. Royal Vegas Casino offers over 600 games from Microgaming. 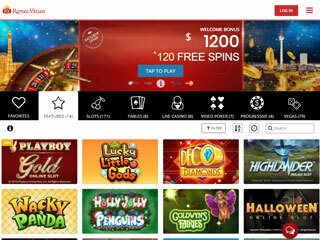 Now, Microgaming is a granddaddy in the online game provider business. They were developing games when many of the over 150 providers active today were still in short pants. 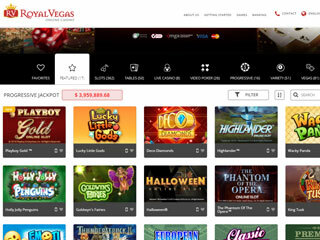 Recently, Royal Vegas has begun to feature games from multiple providers. There is simply too much creative energy out there going into games for a casino to restrict itself to just one. Royal Vegas has hundreds of great slots. Some of our favorite slots are still Microgaming creations such as Big Kahuna, with its two bonus rounds featuring a belching, ominous volcano and world class hand carved wooden masks and Sure Win with the rousing rendition of the Lone Ranger Theme during the running of the bonus round. Video slots have great extra features like wild and scatter symbols, free spins bonus rounds, multipliers, cascading and stacked reels and much more. The casino also runs sixteen progressive games. The biggest one of all is Mega Moolah whose jackpot restarts every time at one million dollars. Royal Vegas has a full selection of table games including blackjack, roulette, craps, poker, and baccarat plus several games you might not have played yet such as Red Dog and Pai Gow. Video Poker is possibly the most popular of all online casino games because the payout rate is so high—close to 99%. If you like poker, you can play video poker in single and multi-hand forms and, by playing with a strategy card, you stand a good chance of winning. Finally, the casino features some playful casual games like scratch cards and bingo. The games at Royal Vegas are both plentiful and varied so you can have hours of great gaming fun there. The casino also has a sizable mobile adjunct which is actually becoming more popular than the desktop version. You can also play at the Live Casino which recently underwent a much-needed overhaul. On your first deposit, you get a 100% matching bonus up to $€250 plus 30 free spins on Dragon Dance. On your second deposit, you get a 25% matching bonus up to $€200 plus 40 free spins on Wild Orient. On your third deposit, you get a 50% deposit bonus up to $€750 plus 50 free spins on Suntide. As we said above, we have to point out slight things that we hope Royal Vegas begins to incorporate in their otherwise excellent casino. In that vein, we must say that we like to see a no deposit bonus before players have to make a deposit. More serious is the excessively high play through requirement of 50x for the Welcome Package bonuses. We hope that the casino lowers this requirement to the much more palatable 35-40x range. The Loyalty Programme at Royal Vegas Casino is like most other such programmes. You get points for each deposit based on a formula that rewards slots play above all other games. There are four levels in their loyalty programme: silver, gold, platinum, and diamond. We assume that the diamond level corresponds to some sort of VIP Club but we found no mention of it on the casino’s site. Royal Vegas also runs monthly promotions that change each month so keep your eyes open for them. Royal Vegas offers 40 different deposit options but far fewer options for withdrawals. They also have a $5000 per week limit on withdrawals which with today’s inflated currency values, seems too low. The deposit options include credit and debit cards, ewallets, direct bank transfers, bank draft, pre-paid card, and vouchers. We are surprised that the casino has as yet not added bitcoin as a deposit option. Surely, that will come soon. You can deposit in many currencies aside from bitcoin. Royal Vegas uses the finest encryption software to protect your money and your privacy at all times. Most casinos these days run a call center that stays open on a 24/7 basis. We also assume that Royal Vegas has a toll-free number that you can call to speak directly with a representative. However, the phone number has disappeared from the site. We hope they get it back on the site as it has always been a primary way for players to contact the casino. Royal Vegas has a large cohort of happy and satisfied customers who have made it their default online casino. That in itself is a great accomplishment for this casino as competition is enormous in the online casino business and Royal Vegas continues to hold its own. We hope that the casino will add some features that a lot of modern casinos have. But all in all, Royal Vegas remains a great place to play online casino games.